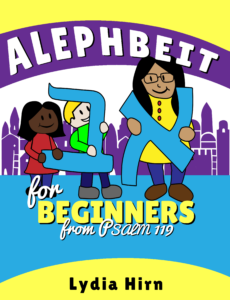 Alephbeit for Beginners from Psalm 119, by Lydia Hirn, will teach you all of the Hebrew consonants as well as 135 Modern Hebrew vocabulary words, using Psalm 119 as a starting point. New This Week and Currently Being Added to Your Membership! However, because of the death of Anne Elliott’s father on April 5, we have not been able to upload it yet. We will send out a notice to everyone as soon as it is here.